Addison Rothrock was a rocket propulsion specialist at the dawn of the Space Age. Rothrock graduated from Pennsylvania State University in 1925 with a B.S. in physics and joined the staff of the Langley Aeronautical Laboratory the next year. He worked in the areas of fuel combustion and fuel rating, contributing more than 40 papers and reports, and rising to the position of chief of the fuel injection research laboratory. 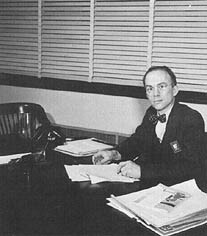 In 1942 he moved to Lewis Laboratory (now known as Glenn Research Center), where he was chief of the fuels and lubricants division and then chief of research for the entire laboratory. In 1947 he became assistant director for research at NACA (National Advisory Committee for Aeronautics) Headquarters. With the foundation of NASA, he assumed the duties of assistant director of research (power plants). Two months later, he became the scientist for propulsion in, and then the associate director of, the office of program planning and evaluation. Rothrock retired from NASA in 1963 and taught for five years at George Washington University.